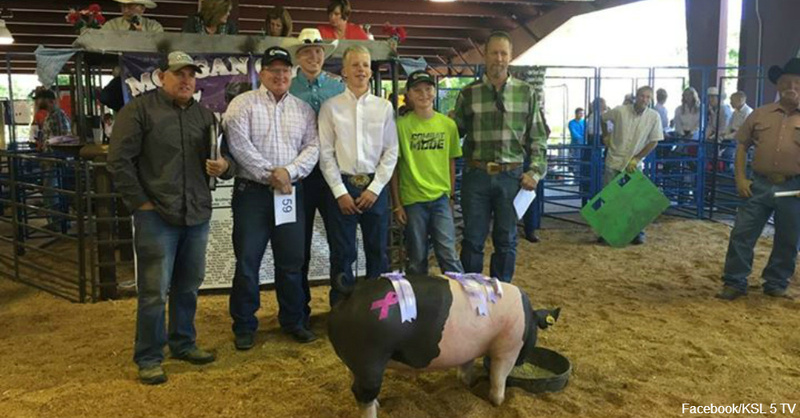 When the pig that 15-year-old Cade Russell had raised himself went up for auction at the Morgan County fair, the bids quickly got out of hand. The 277-pound animal may have looked very similar to the one before it that sold for just $2,700, but Cade’s pig had immediately incited a full-on bidding frenzy. Cade had no way of knowing it beforehand, but some of the locals had gotten together and agreed to use the auction as a means to raise funds for his mother’s medical bills. By the time Cade’s pig sold, the price had shot all the way up to $31,000, the result of three local men continually outbidding each other. Cade and his brothers had often sold pigs at the county fair and put the money in a college fund, but this time was different. In the end, the three men split the cost of the pig, and the money went directly to Cade’s family. Monica Russell, a schoolteacher and mother of two, had been engaged in a battle with breast cancer for some time, and it was no secret to the small town of Morgan that her medical bills had been piling up. The bidding arrangement serves as a perfect example of a tight-knit community coming together to help out those in need. As for Cade, the experience ranked among the happiest moments of his life. He was as surprised as the rest of the town when the number kept rising, but there was no doubt in his mind that every cent of the earnings should go to his mother to aid her fight with cancer. Cade’s story is far from the only example of a supportive community fighting cancer through creative means. Learn about the interesting ideas others have had to raise money for breast cancer research, such as these cabaret actors who put their talents to work to fight cancer.